Welcome to my spot in the ether. I'm an English teacher at NUS High School. I dream of shaping the region's future in the classroom and, soon, in the marketplace of ideas. During study breaks, I do research in literature, especially St. Augustine's interpretive ideas, Chaucer, Pope and Flannery O'Connor. Like those writers, I hope to share my perspective on things that matter. I'm also a veritable citizen of the global economy, with some achievements in editing, journalistic writing (for the English-language Taiwan News, Asian Infrastructure Monthly and the Far Eastern Economic Review) and teaching overachieving students (e.g., in Hwa Chong Institution [College] and NUS High). I’m a kind of displaced person: born Filipino, with a Chinese (what some mistake as Japanese or Korean) face, a Spanish family name and creative work in English. In my 20s, I became like Clark Kent—that is, a journalist. I was so for an English-language daily in Mandarin- and Hokkien-speaking Taiwan. I reinvented myself and, along the way, picked up a foreign tongue, that of my maternal grandfather. In the prime of life, I teach English—spelled in British fashion—in a place that is uniquely Singapore. This island is both Asian in its vaunted Confucian values and Western in its occasional high-risk, high-gain investments. I face the future with a sunny outlook that has served me well but with slight quavering. Let me tell you what else keeps me busy for most of my waking hours: I'm exploring the use of St. Augustine of Hippo's interpretive theory of reading (distinguishing between literal and figurative interpretations) in the study of cupiditas (disordered love of self that prevents communion with others and the Other) in the works of Chaucer, Jonson, Pope and Flannery O'Connor. St. Augustine says that the end of interpretation (principally of the bible and secondarily of other Christian-inspired texts) is charity, the ordering of values with turning to God on top and turning to the self at bottom. It follows then that any allegorical text that may seem to subvert this order should be interpreted not literally but figuratively.I am trying to see now just how each writer brings the uniqueness of his or her time and culture to the shaping of allegory in depicting evil or the lack of good in fictional characters. In so doing, I am testing just how fruitful still is the classical interpretive mode of St. Augustine in generating criticism and, in that light, will outline some fictional models for the depiction of cupiditas (which necessarily presupposes a prior and superior caritas). Singapore is a grab bag of things representing the full continuum of goodness (It's clean, all right, but no Disneyland.). The heat is unbearable (worse than in Manila), but its lush gardens make it a pleasant home (Looking out the living room window, I'm treated to a soul-soothing sight of a palm-lined garden that conceals the awkward backhand of some NUS dormers at the tennis court. ).The weather here sort of reminds me of Taiwan's spring: it rains at least once a week. Because of that, Singapore's shrubbery looks a deep shade of green all year round --unlike Japan or Texas in late winter. This city-state is not really as uptight as most people think. Some people jaywalk; I've seen a housemate without a car seatbelt on; teenagers can now stand up and dance at concerts; a pair of my slacks once got smeared with -- chewing gum. Hey, they're loosening up! Prior to postgraduate research, I worked in Taipei as a business reporter and columnist at the English-language daily Taiwan News. I stretched my mind by covering diverse fields from information technology to cross-strait relations. That experience gave me opportunities to grab freebies and to chat with world shakers (great salesmen too) such as Microsoft Chairman Bill Gates, Intel Chairman Andrew Grove, Acer Chairman and CEO Stan Shih and Yahoo! 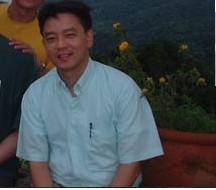 co-founder Jerry Yang. A decade ago in Manila, I tried to put sense into the papers of woolly-headed economists as an editor for top think tank and academic institution University of Asia and the Pacific (formerly Center for Research and Communication). I was also privileged to have taught Composition to four batches of "creme-de-la-creme" students at UA&P. As there are many sources and intensities of light, so are there many shades of truth in this fractured world. Given our very limited stay here, I think it is quite good to reach for the fullness of truth that faith and reason can make us attain (As Pope said, "What nothing earthly gives, or can destroy,/ The soul's calm sunshine, and the heart-felt joy,/ Is virtue's prize.... [not] 394 erring Pride...."). This is a struggle for me and most people. I'm an English teacher at the National University of Singapore High School. Read one of my poems, "Aceh Reborn," in The Thirty-first Bird Review.